A fantastic and enjoyable day was reward for a strong effort by the wardening team and the small number of visiting birders resulting in a diverse range of species, recorded in some impressive totals. 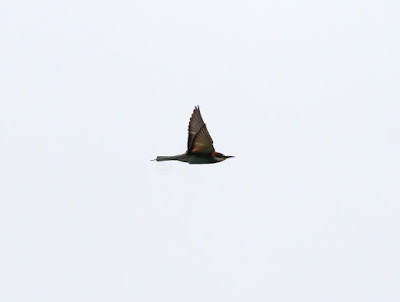 In a brisk southerly wind there were three main events of the day, beginning with a quite staggering passage of southbound Swifts during the first few hours of the morning. The former day record of 182 was easily broken (in about 20 minutes) when a 'viz-mig' session from Holland House between 7 and 10am recorded 352 passing south. 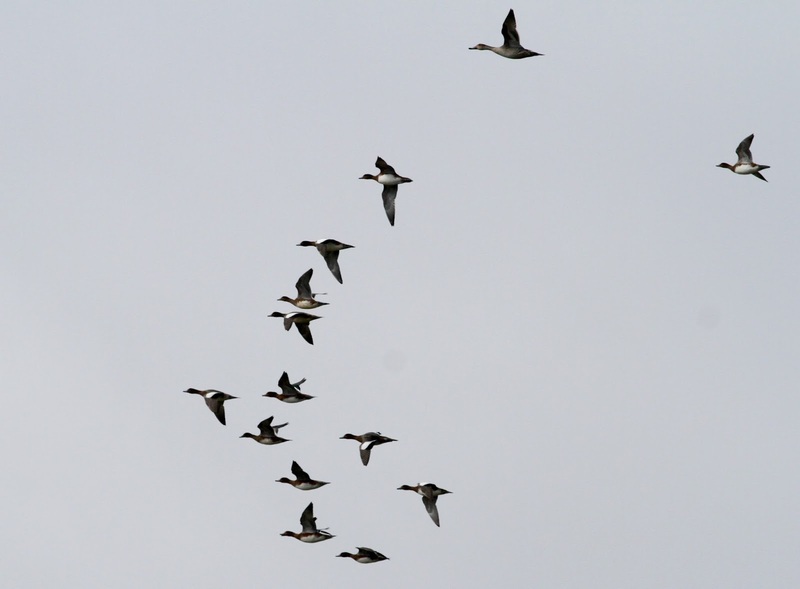 This included flocks of 143 and 80 and with additions from birds arriving later in the afternoon the final tally came to a minimum of 395 birds. Next came a mid-morning slice of luck when a juvenile/first-winter Citrine Wagtail flew in calling and landed on a small puddle next to one fortunate team member near Hooking Loch. It remained for just 20 seconds before heading off in the Bridesness direction but despite this being a traditional hotspot for the species it wasn't re-found today. 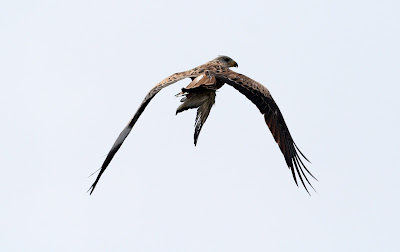 Star act number 3 was very much a local affair, when a species commoner further south but only North Ronladsay's third ever record of a Red Kite, was picked up drifted in from the east Links mid-afternoon before settling and performing well on the west coast. Onto commoner species, and birds moving rapidly south were again the most evident with 229 Swallows, 2 Sand Martins, 627 Meadow Pipits, 21 White Wagtails, 38 unidentified 'alba' Wagtails and 90 Wheatears logged. 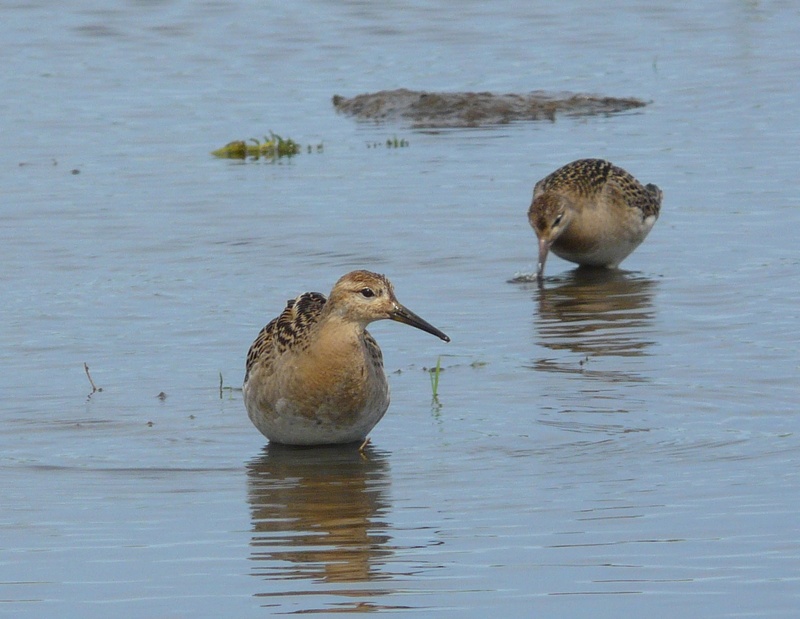 Wildfowl and waders were also moving as 106 Wigeon, 7 Pintail, 70 Ruff, 140 Snipe, 232 Redshank, 6 Greenshank, 2 Green Sandpipers, 3 Wood Sandpipers and the Curlew Sandpiper were also recorded. 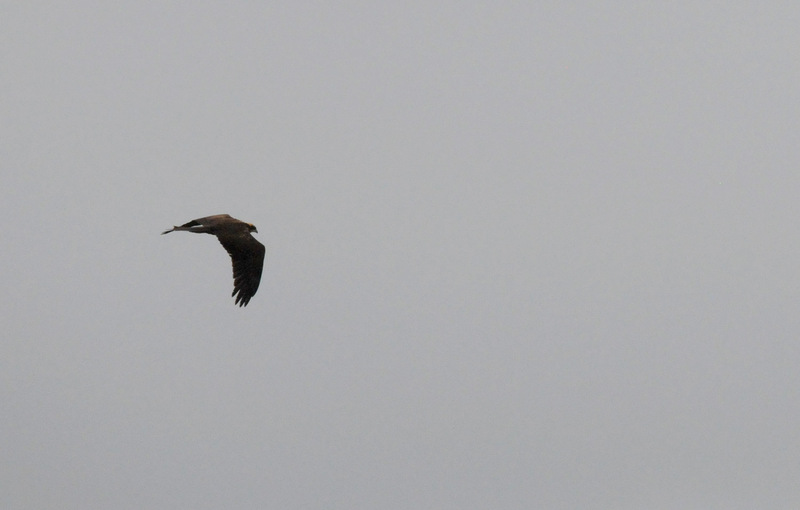 The sea-watchers also had a better day notching up 11 Sooty Shearwaters, 13 Arctic Skuas 25 Great Skuas (although 7 of these were mobbing the Kite a one stage!) and 182 Kittiwakes - 174 of them juveniles so the species has had a decent breeding season somewhere. There were also 112 Arctic Terns, 3 Common Terns and 79 'Commic' Terns (most of those on sea-watch) while other odds and ends included 2 juvenile Marsh Harriers again, 3 Kestrels and 18 Willow Warblers. 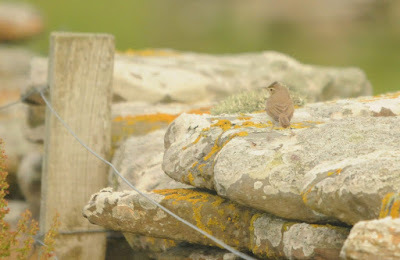 Plenty of birds on the move again in a light south-easterly wind and once more it was diurnal migrants which dominated. 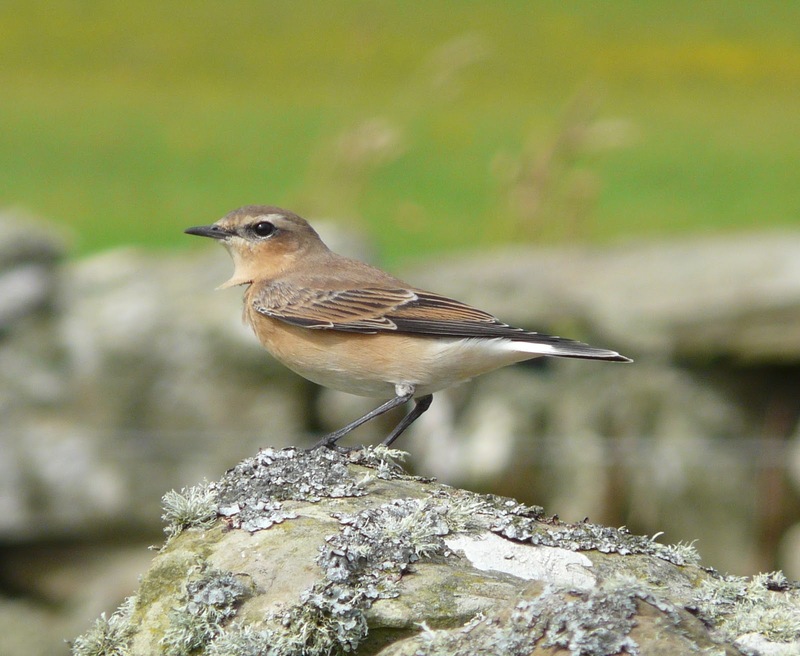 Totals of 173 Wheatears, 10 White Wagtails (with 18 unidentified 'alba' Wagtails), 206 Meadow Pipits, 245 Swallows and 116 Swifts were all highest counts of the autumn so far for those species. 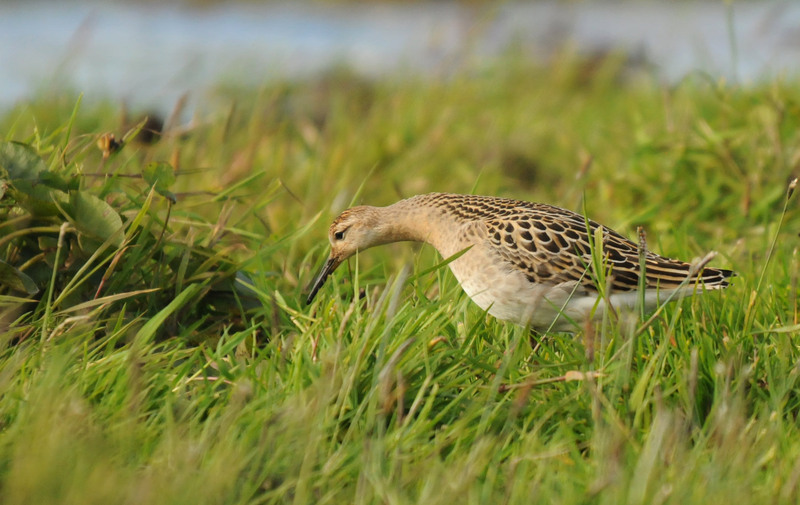 The Ruff record was broken once again when 144 (143 of them in one field!) 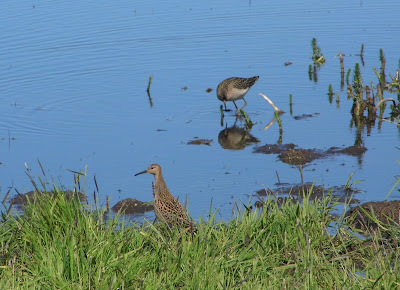 were counted while the Curlew Sandpiper reappeared on Trolla Vatn Loch and 2 Greenshank and a Wood Sandpiper lingered in the south east of the isle. After seemingly moved on, a new build up of Arctic Terns has brought their number up to 110 and with them there are 6 Common Terns and the evening concentration of Kittiwakes in Nouster bay grew again to an impressive 402 - most of them juveniles. 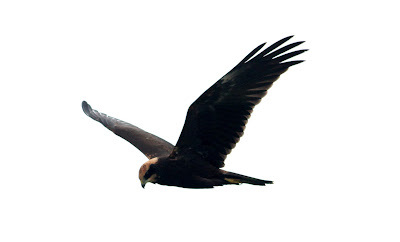 The Marsh Harrier and a couple of Kestrels continue to tour the island while some effort by visiting sea-watchers recorded the first 'blue' phase Fulmar of the autumn along with a Sooty Shearwater and 2 Manx Shearwaters. 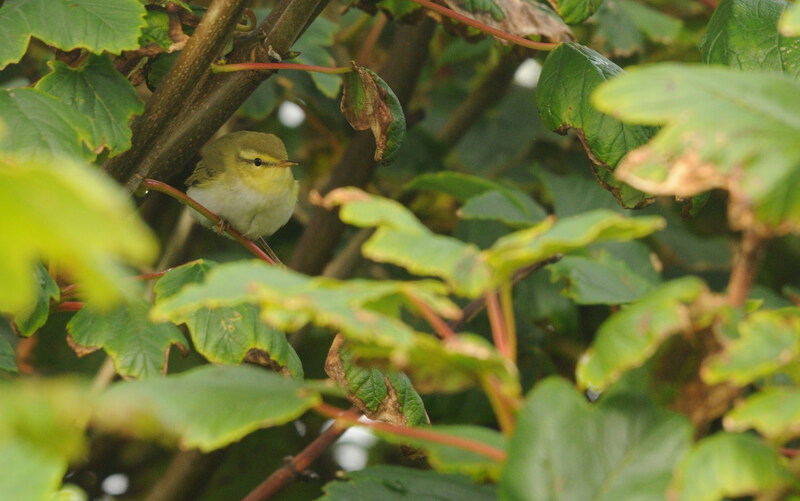 A day of bright skies and sunshine didn't feel like it would deliver much in the way of new arrivals especially after the morning ringing session at Holland gardens yielded a single re-trap Garden Warbler! 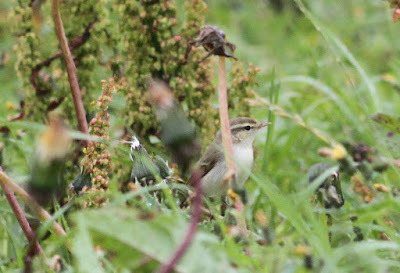 However we were proved wrong when a smart (and occasionally vocal) Greenish Warbler appeared in the Surgery garden just before midday-our second of the year and the tenth island record. Otherwise a Blackcap and Tree Pipit were new and there was a smattering of 'old' warblers which included a Wood Warbler at Holland and 2 Reed Warblers. At least 51 Swifts were logged and Ruff numbers were again in three figures with 111 recorded. 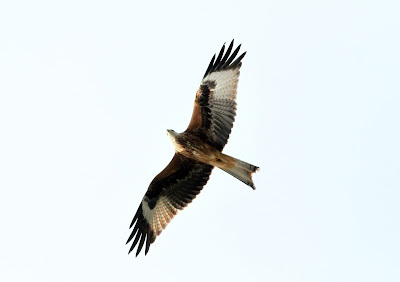 The Marsh Harrier and female Sparrowhawk from yesterday also remain. A glorious day, with not a breath of wind and some fantastic autumnal sunshine made for another enjoyable day in the field. 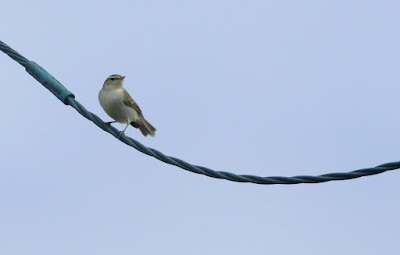 The land was somewhat quieter with a 'clear-out' of roughly 50% of yesterdays passerine migrants but nevertheless a single Icterine Warbler (Westness) and Barred Warbler (Holland) hung on. 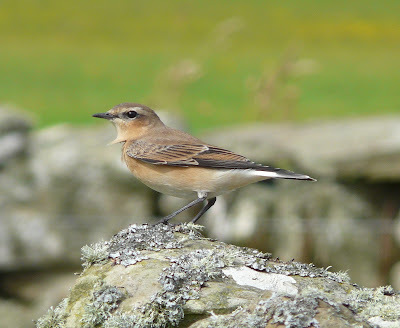 Diurnal migrants were the most conspicuous with 78 Wheatears, 30 Swifts and 182 Swallows notable, while a good spread of warblers still included 41 Willow Warblers, a Wood Warbler, a Blackcap, with 2-5 each of the other recently recorded species. 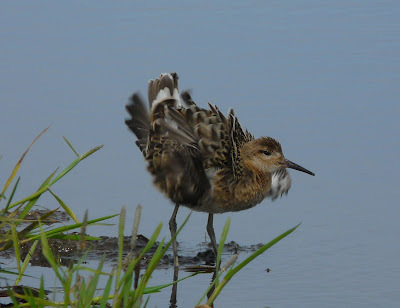 A moulting adult Curlew Sandpiper on Trolla Vatn Loch was the best wader while the 3 Wood Sandpipers lingered at Cauldhame flash where the Garganey also resurfaced briefly. Just one Marsh Harrier was seen for certain today but 2 Sparrowhawks were new and 3 Kestrels were still about. An finally, there was an interesting late evening gathering of 235 Kittiwakes off the pier which then moved off west and with them came a swift movement of 34 Arctic Skuas and 10 Great Skuas past the Obs in just 20 minutes! With favourable conditions, migrants continue to move through the island in good numbers and the birding remains exciting. 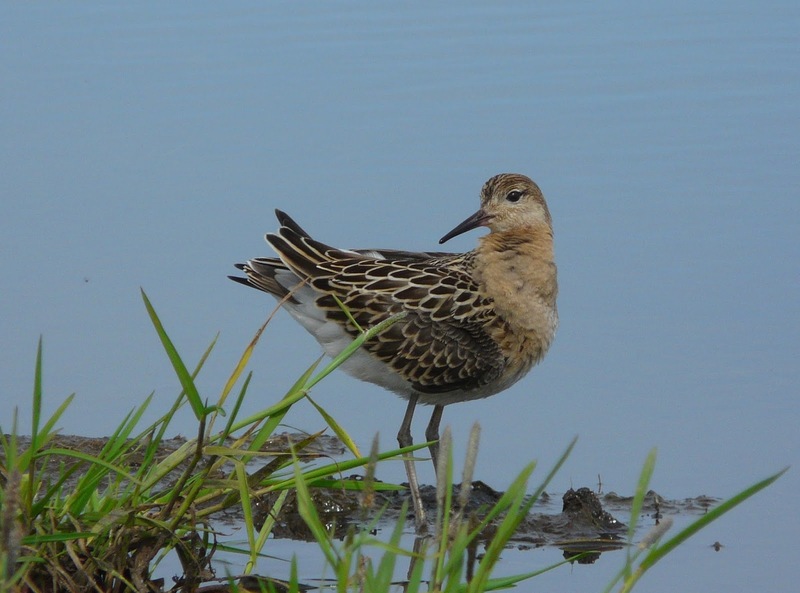 We'll begin with waders for a change - this years Ruff passage has been one of the highlights with very high numbers all month and today the 'day total record' was finally broken with a minimum of 125 present. 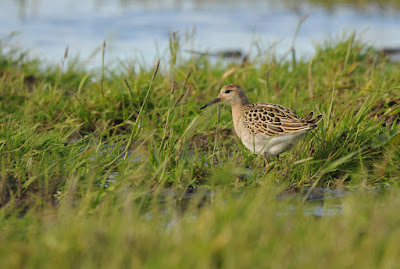 The 3 Wood Sandpipers also remain, with 63 Black-tailed Godwits and 2 Greenshanks also of note. 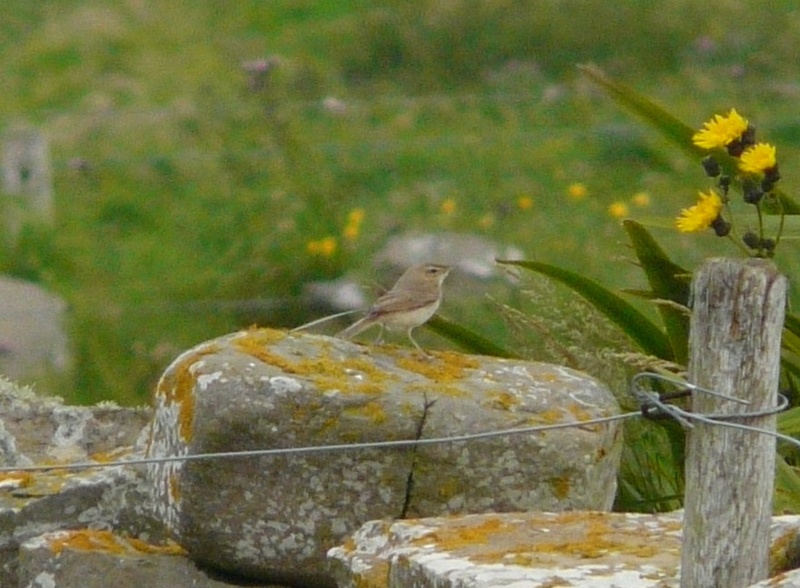 Passerine highlights included 3 Icterine Warblers (lingering birds at Westness, Obs and Holland), 2 Barred Warblers (old birds at Holland and Nether Linnay), 2 Wrynecks (North Manse and Holland-the latter sadly died) and 2 Rosefinches (Holland and West Beach). 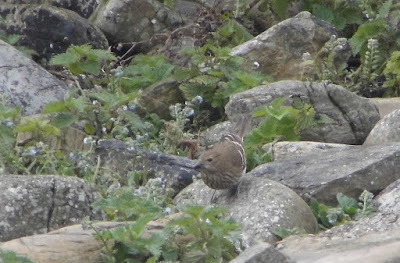 There was also the first conspicuous movement of Meadow Pipits with 184 noted plus 2 Fieldfares, 5 or 6 each of Garden Warbler, Lesser Whitethroat, Whitethroat and Reed Warbler, 79 Willow Warblers, 2 Wood Warblers, a Tree Sparrow and 10 Redpolls. An adult and juvenile Lesser-black-backed Gulls were the first for 2 weeks, both Marsh Harriers are still with us along with 4 Kestrels, 2 Merlins and a Peregrine. 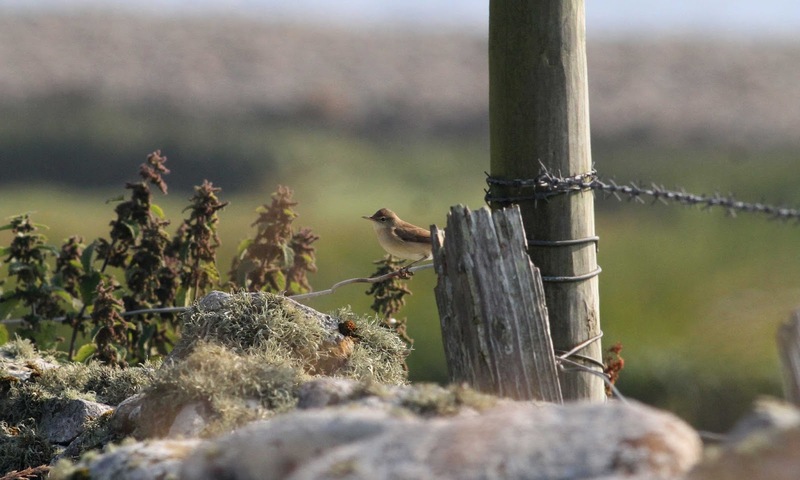 With the wind dropping and rain due from lunchtime there were high expectations and though there was no major rarity, many species were recorded in high numbers during this particularly prolific period for the isle. Two species dominated, with the counts of 103 Willow Warblers and 31 Garden Warblers both the highest day totals for a decade. Once the rain arrived there seemed to be birds dropping in everywhere with tallies of 8 Kestrels (possibly more! ), a Wryneck (trapped and ringed at Holland gardens), 6 Redstarts, 26 Whinchats, 83 Wheatears, 4 Fieldfares, 5 Sedge Warblers, 7 Reed Warblers, 4 Icterine Warblers (Westness, Holland, Obs, Antabreck), 2 Barred Warblers (Holland, Kirbest), 3 Lesser Whitethroats, 5 Whitethroats, a Blackcap (first of autumn), Wood Warbler (Greenwall), a juvenile Red backed Shrike (also at Greenwall), 4 Spotted Flycatchers and 6 Pied Flycatchers. The 2 juvenile Marsh Harriers continued to flush all the waders, but among the most notable of that group counted were 85 Ruff, 72 Black-tailed Godwits, the 3 Wood Sandpipers and 2 Green Sandpipers. 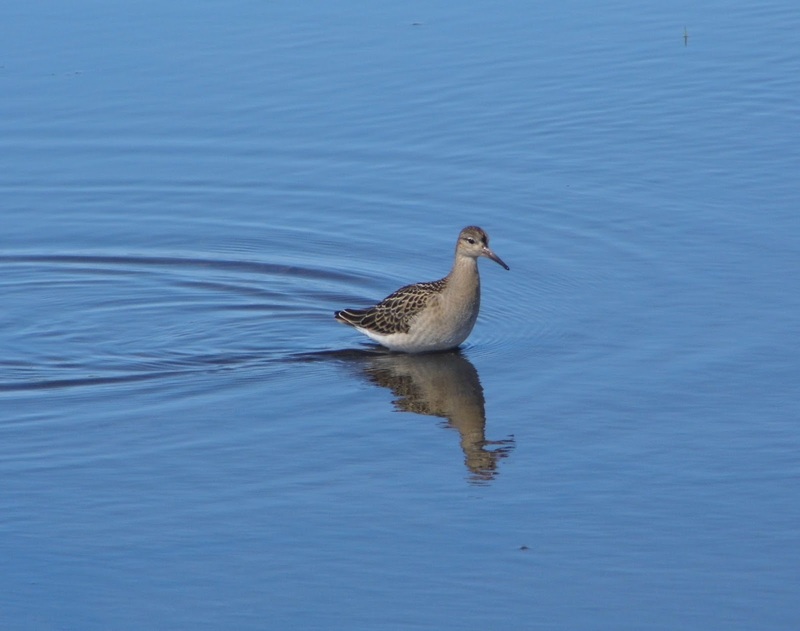 A juvenile Garganey on the Loch at Bridesness was a surprise and Teal numbers have grown to 72. Not quite so many Butterfly's as yesterday but a Minke Whale sighted from the ferry boat between the isle and Papa Westray was the first of the year. 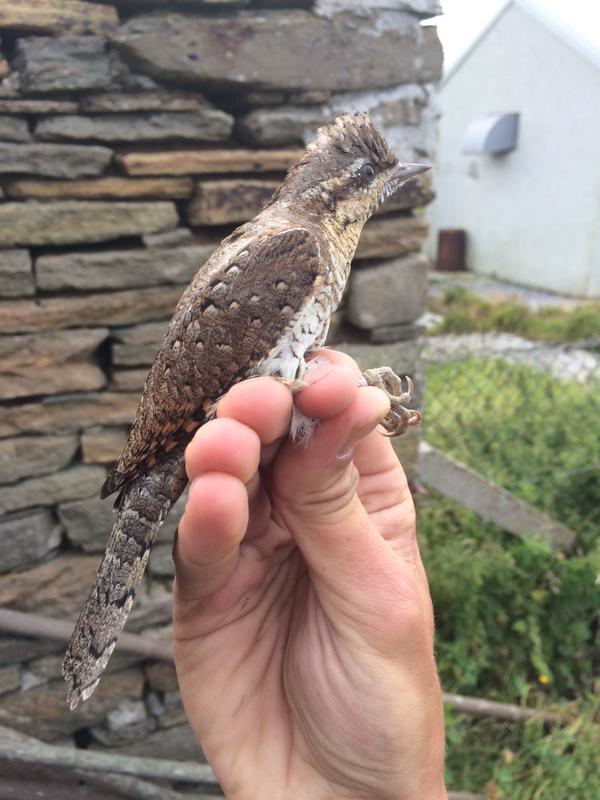 Another day with a strong easterly wind brought another wave of new birds, although migrants caught and ringed at Holland gardens once the wind subsided in the evening were in good condition with high fat scores suggesting they were keen to move on. A second juvenile Marsh Harrier was perhaps the most notable arrival, with 3 Icterine Warblers (including a new bird at the Obs) and 2 Barred Warblers (new bird at Holland) also topping the bill. 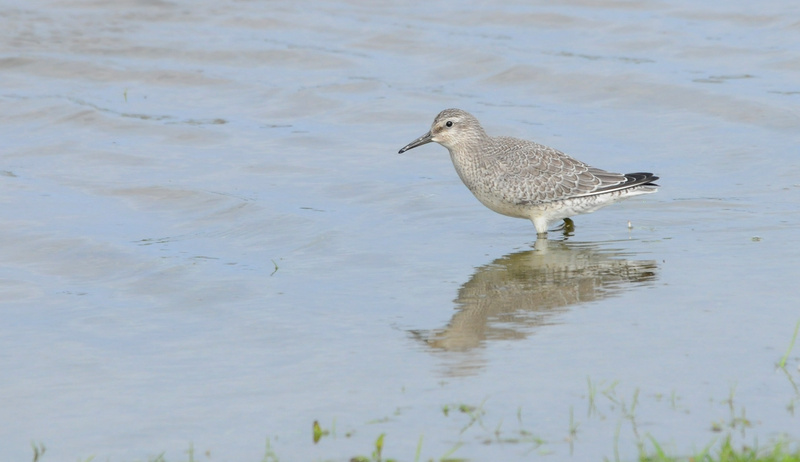 An adult male Hen Harrier was the first since the summer and 3 Wood Sandpipers remain with 5 Common Sandpipers on the coast. 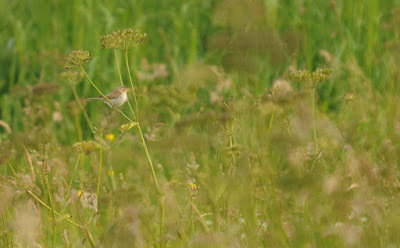 Totals for migrant passerines came to 27 Whinchats (the highest count for many years), 4 Redstarts, a Fieldfare, 2 Lesser Whitethroats, 8 Garden Warblers, a Wood Warbler at Holland, 69 Willow Warblers and 3 Spotted Flycatchers. Butterfly numbers were also well up with 77 Painted Ladies, 28 Red Admirals and a Small Tortoiseshell. It was back to full census today, with all 6 routes visited in bright and breezy conditions. There was no sign of the Booted Warbler although that area seemed particularly exposed but there were 3 Icterine Warblers (Phisligar and 2 at Senness), 2 Barred Warblers (Ides Taing and Scotsha) and a Wryneck (Stromness Point) all recorded. Calculating exactly which birds might have been new is proving problematic with none of the recent scarcities (and many of the more notable migrants) being seen at the same locations day after day and while some local movement seems inevitable, there are clearly a lot of birds passing through the island at the moment. 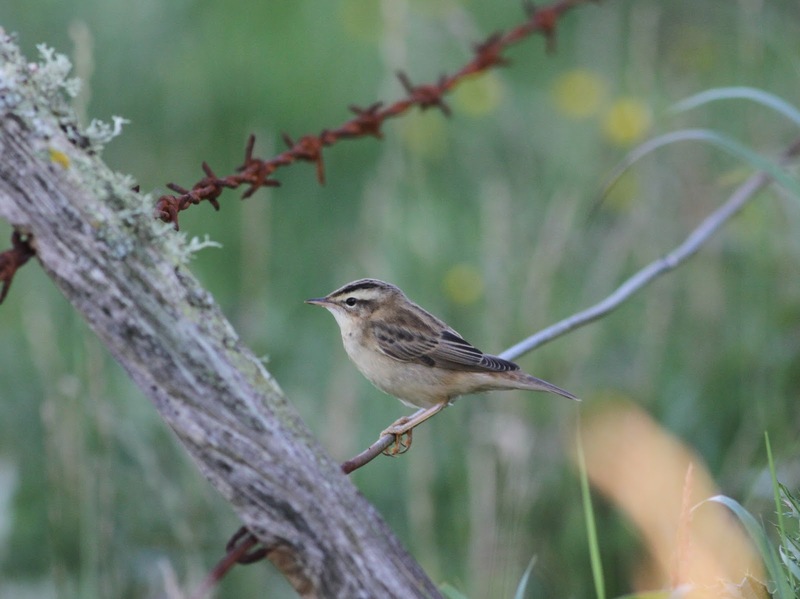 Other migrant figures came to 8 Whinchats, a Redstart, 31 Willow Warblers, 3 Reed Warblers (all different from those of 22nd), 3 Whitethroats, 7 Garden Warblers, a Wood Warbler at Gravity, 6 Pied Flycatchers, 2 each of Kestrel and Merlin were present, along with 76 Ruffs and 2 Wood Sandpipers. Coverage was sacrificed somewhat today with the annual ringing of the isles young Fulmars around the coastline sourcing around 12 hours man (trainee ringer) time. 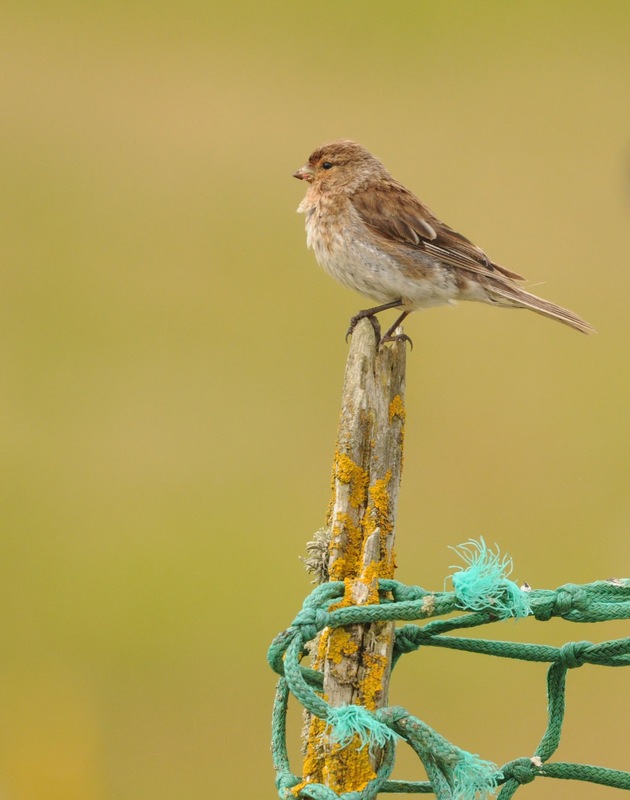 All in all, 120 (130 total in 2015) were fitted with BTO rings, which was down on the 157 ringed from the same total area in 2014 reflecting a poorer year for the population as we'd largely suspected. A couple of census routes were visited with the noted highlights being the Booted Warbler at Nether Linnay still, 2 Barred Warblers, an Icterine Warbler plus the Marsh Harrier. 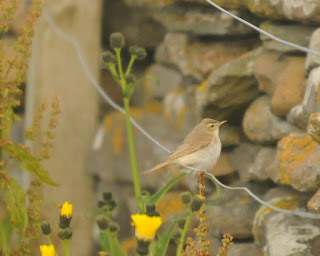 A gathering of 45 Swifts was comfortably the highest count for some years while there were also 2 Fieldfares, a new Grasshopper Warbler at Greenwall, 4 Reed Warblers (3 of which were trapped at Holland), 7 Garden Warblers, a Wood Warbler at Holland, 34 Willow Warblers and 2 each of Pied and Spotted Flycatchers. Singles of Woodpigeon and Collared Dove were the first in a while, with other species in numbers worth mentioning being 60 Black-tailed Godwits, 7 Common Sandpipers and 3 Common Terns. And still they come!! The birding can only be described as fantastic (and exhausting) at the moment as migrants, scarcities and even a rarity were found today. 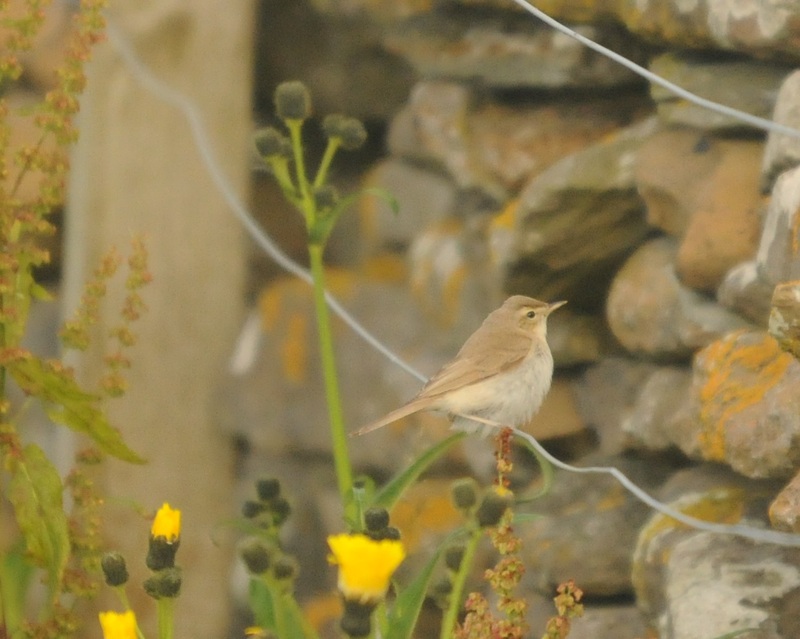 Star of the show was North Ronaldsay's fourth ever BOOTED WARBLER discovered at Nether Linnay (and co-found by new volunteer Jonathan on his very first day!!). 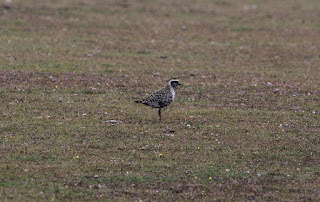 Initially the bird was mobile and elusive moving as far as Sandar but had showed well to all by evening. There was backup by 2, presumed new Icterine Warblers (at Nether Linnay and Westness), 2 Barred Warblers (including a new bird at Rue), the lingering American Golden Plover and the Marsh Harrier. 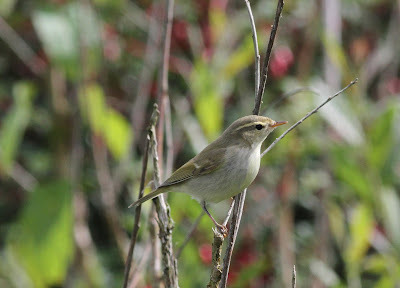 Despite some migrant passerines having perhaps moved on there was still plenty to see with 54 Willow Warblers, 10 Garden Warblers, another Grasshopper Warbler (Nether Linnay), Reed Warbler, 9 Whinchats, 3 Redstarts, 2 Spotted Flycatchers, 9 Pied Flycatchers, a Tree Sparrow and 8 Redpolls counted. A total of 10 Greenshanks included many heading straight over south, and there were 168 Knot, 3 Wood Sandpipers and 3 Common Terns also seen. Migrant Painted Lady Butterflys were cropping up everywhere with at least 54 noted along with 10 Red Admirals. 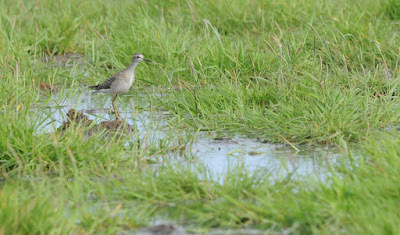 Heavy rain hampered the mornings census, while intermittent fog in the afternoon also made things tricky. 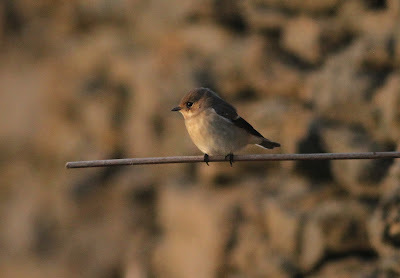 Nevertheless, you try keeping us inside at the moment with so many birds about and the team's efforts produced another good tally of birds with many newcomers noted, especially in the afternoon. 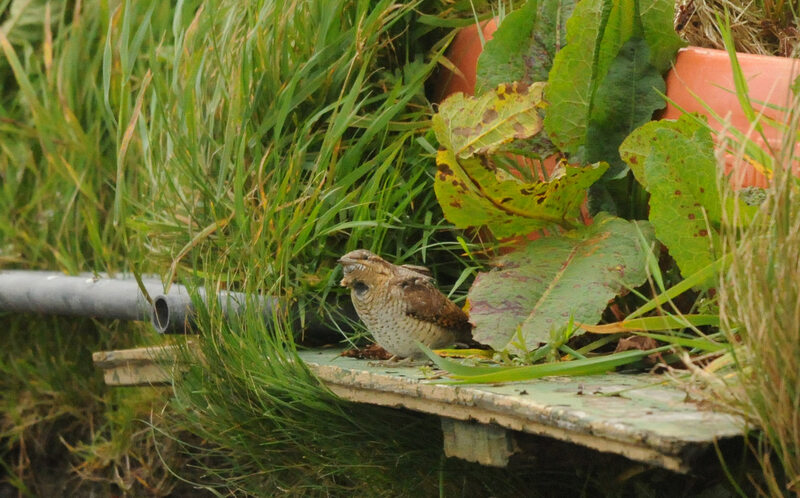 Most of yesterdays Wrynecks had moved on, with just a single trapped at Holland House, although they were replaced by a fantastic 4 Icterine Warblers (Holland, Stennabreck, Vincoin and Phisligar). There were also 2 Barred Warblers (Holland and Nether Linnay), the American Golden Plover was still near the Lighthouse while the juvenile Marsh Harrier continued to tour the island. 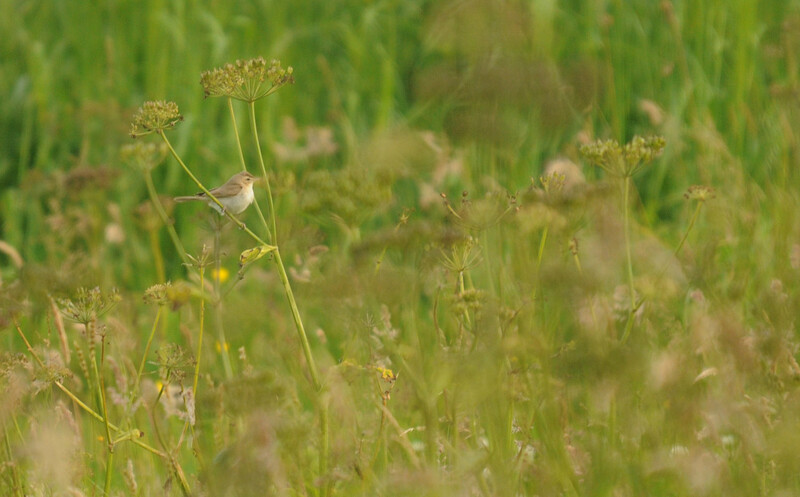 Day totals for more notable passerines came to 60 Willow Warblers, a Wood Warbler, 12 Garden Warblers, 3 Whitethroats, a Grasshopper Warbler, Reed Warbler, 18 Whinchats, a Tree Pipit, 2 Spotted Flycatchers, 7 Pied Flycatchers plus a Tree Sparrow. There was also another surge in waders with an island record count of 5 Wood Sandpipers (all in one flock at Cauldhame flash), and other highs of 188 Knot, 107 Ruff (equalling the record count), 116 Dunlin, 1402 Golden Plovers, 3 Greenshanks, 5 Green Sandpipers and 5 Common Sandpipers. Breath-taking stuff!!! Torrid conditions, with a strong easterly wind and heavy rain all day made the birding difficult but as there were clearly plenty of birds about the team put in a fair effort despite being soaked all day. 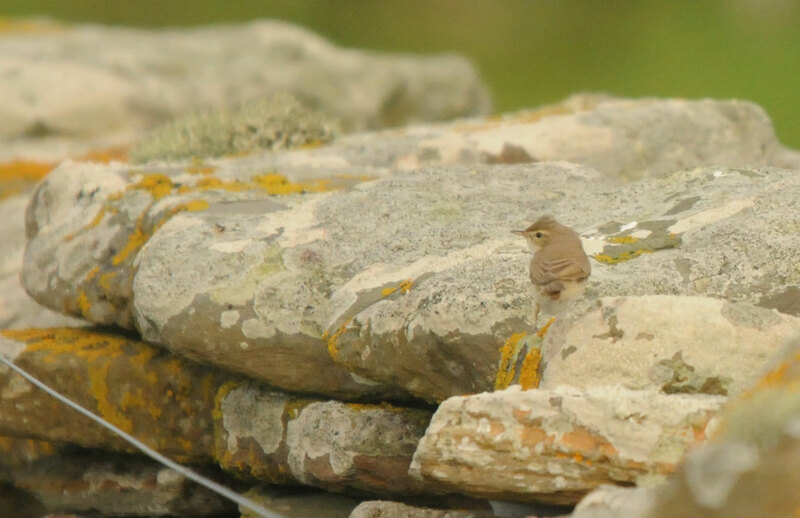 An impressive 'fall' was evident from dawn and the days totals of passerines comprised a Wryneck (Obs), a Tree Pipit, Redstart, 5 Whinchats, 3 Reed Warblers, 2 Barred Warblers (Obs, Westness), 2 Wood Warblers (Obs, Rue), 22 Willow Warblers 2 Pied and a Spotted Flycatcher. The American Golden Plover was still near the Lighthouse, there were also 53 Ruffs, 11 Whimbrels, 9 Common Sandpipers, a good count of 419 Common Gulls plus 3 Kestrels bombing about. There was also the sight of 7 Painted Lady Butterfly's on the wing which was somewhat unexpected given the rain and they presumably arrived along with the birds. 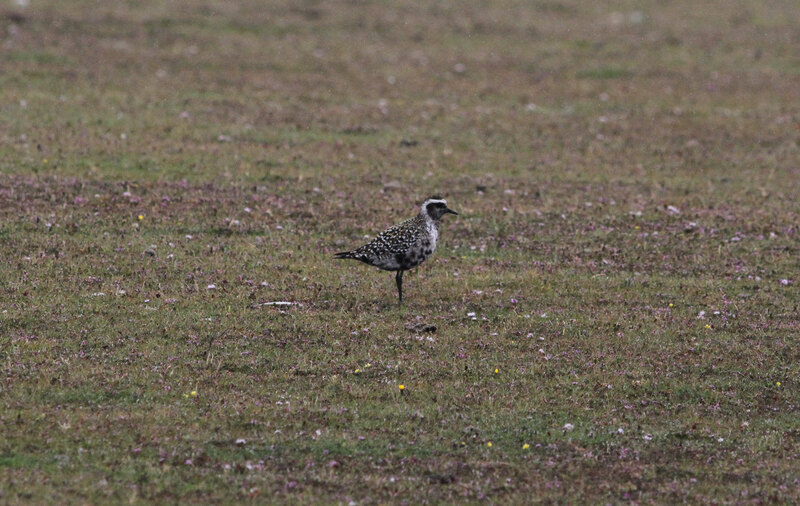 As the weather set in around midday on the 14th, an American Golden Plover was discovered commuting between Trolla, Sjaiver and the grassy area behind the lighthouse. After 8 records in 6 years, this is the earliest ever record on the island - pipping last year's record by a day. On the morning of the 12th another Bee-eater was discovered flying north over the obs before being picked up on the wires at Holland House, where it proved twitchable for those quick off the mark. The fifth island sighting of the year, it wasn't relocated after flying south mid-morning. Wader numbers peaked at 60 Ruff, 265 Dunlin and 1051 Golden Plover on the 11th, with the Spotted Redshank being last seen that day; while a Little Stint was also present on Gretchen, though elusive until the 12th. 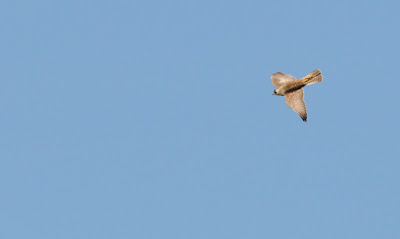 Also present on the 11th was a Kestrel, while on the 12th and 13th a Merlin was seen. 2 different Short-eared Owl were involved in a run of sightings from the 12th to the 14th. 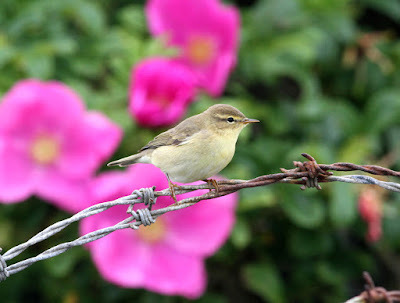 Passerine migration is still proving slow, with only 3 Willow Warblers on the 12th and a Garden Warbler also. 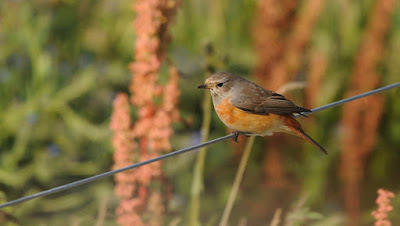 Unseasonal records of Song Thrush and Goldcrest from the Holland Gardens were made on the 13th. At least 5 Redpolls remain. 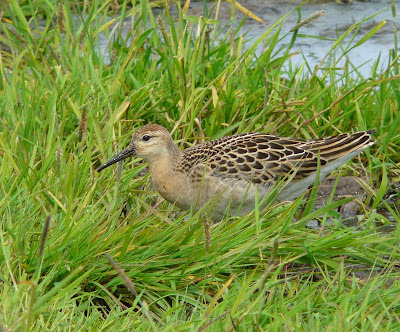 More of the same the last few days with waders continuing to move in the light southerly wind and seemingly forced to land by spells of rain. 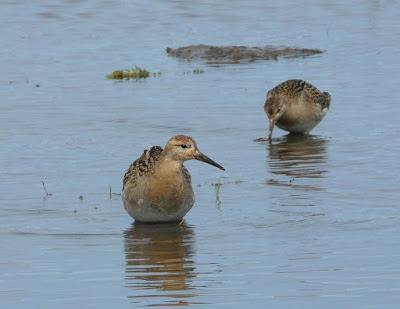 Counts for most species have been at similar levels to the last update (although there will have no doubt been some turnover) with those showing signs of increase being Dunlin up to 253 and Ruff to 62 on the 9th and Whimbrel to 12 on 10th. 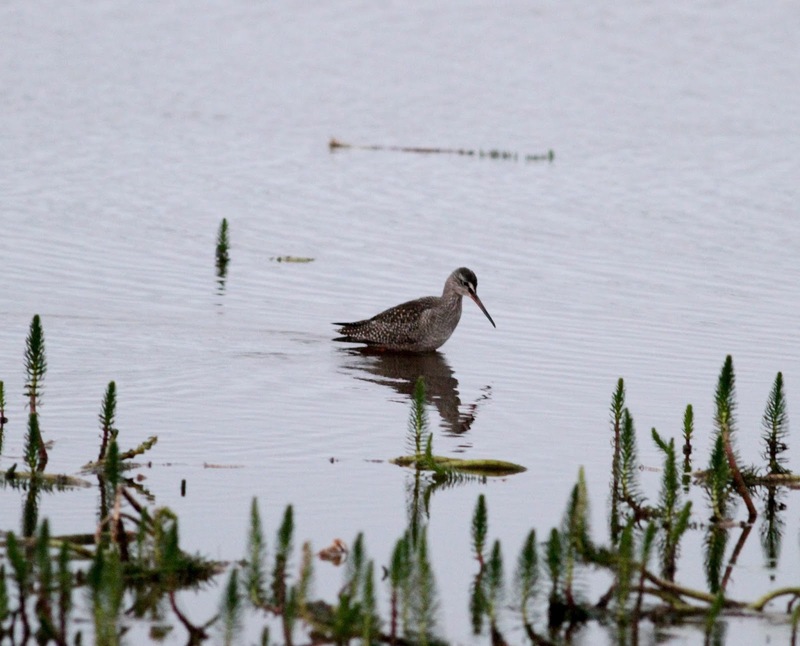 The Spotted Redshank has remained on Gretchen Loch throughout while a Merlin, Short-eared Owl and Woodpigeon were notable on the 9th. That evening, the wind unexpectedly dropped to a standstill allowing 50 new and 1 control Storm Petrels to be caught overnight in a four hour session. Sand Martins have clearly been recorded passing in higher numbers than usual this year, and the 21 on the 10th extends the day total record further while the only warblers have been singles of Willow Warbler at opposite ends of the island on 9th and 10th and a Garden Warbler trapped at the Obs on 10th. 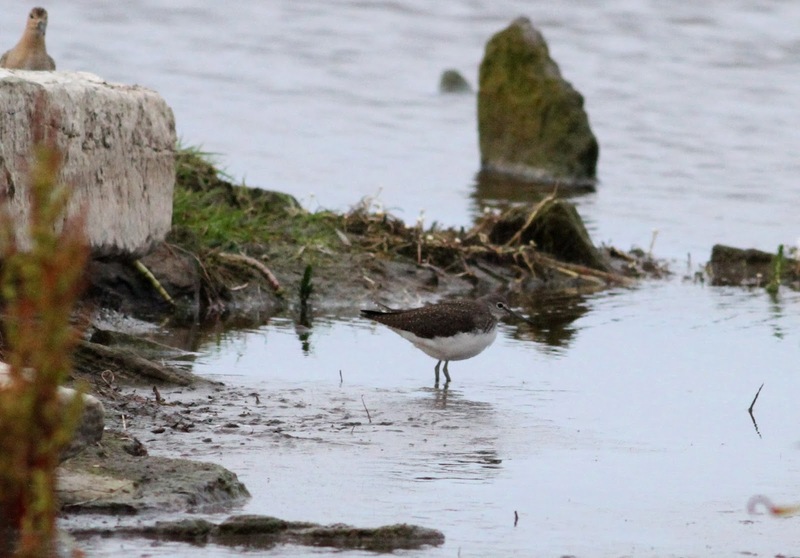 Passage waders have certainly dominated proceedings over the period with Gretchen Loch in particular attracting plenty of interest now water levels are more favourable. 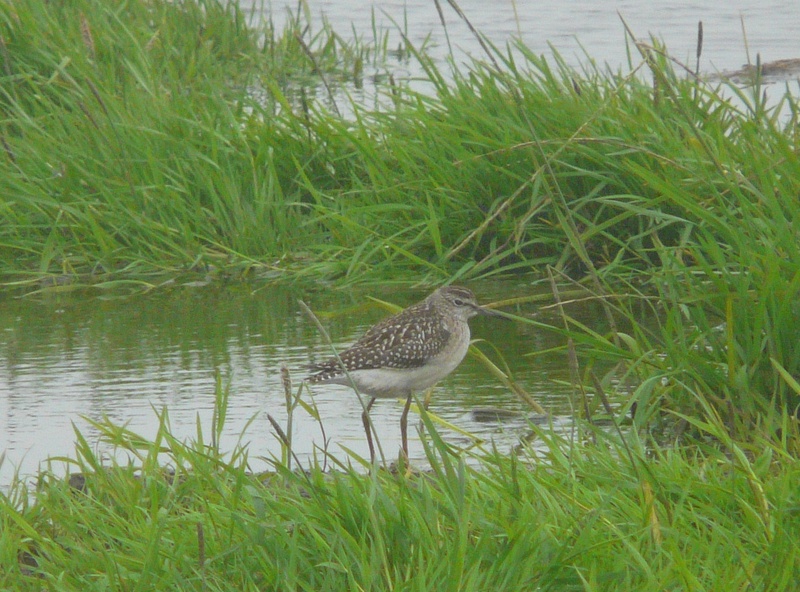 That site pulled in the highlight- a juvenile Spotted Redshank from 6th to 8th while maximum figures of commoner species have been 20 Whimbrel (5th), 88 Knots (6th), 53 Ruffs (7th) and 219 Dunlin, 66 Snipe, 23 Black-tailed Godwits 171 Redshanks and 5 Green Sandpipers (all 8th). There were also plenty of Gulls feeding in the newly cut silage fields on the latter date with 356 Common and 35 Lesser Black-backed among those recorded. A Kestrel (on 5th), had become 2 (7th to 8th) and Swifts have been recorded daily reaching 23 (by 8th). Singles of Garden Warbler (5th) and Willow Warbler (5th to 6th) plus a Fieldfare (8th) have been the most notable passerines, but there were also 3 juvenile Crossbills on the west coast (5th) and up to 14 Redpolls of various ages and guises throughout. The autumn's just starting so we weren't really all that surprised that the rain and south-east winds on the 3rd only brought a few birds. 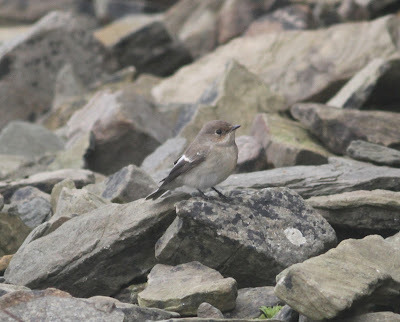 The weather at least offered encouragement and the teams rewards consisted of the first Garden Warbler and Spotted Flycatcher of the autumn while there was a clear increase in Wheatears and Pied Wagtails with a few White Wagtails and unidentified 'alba's also on the move. Grounded waders included 9 Ruffs, 4 Green and a Common Sandpiper and Arctic Skuas have begun to pass in numbers with 14 logged. 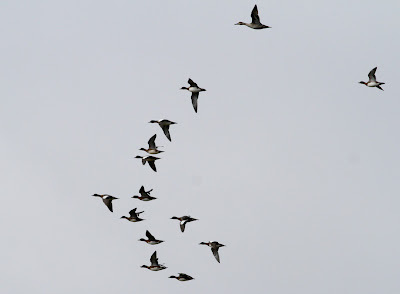 In brighter conditions and a stronger, more southerly wind on 4th there was an unexpected, yet impressive passage of southbound Knot with a minimum of 301 birds - most of which didn't even land! 23 Arctic Skuas also included pairs moving straight through while 280 Sanderlings, 12 Ruff and 2 Green Sandpipers opted to touch-down on the island. A Woodpigeon was new, while 2 Spotted Flycatchers included yesterdays individual with a new one at Trinley and there were 2 Common Redpolls at Ancum Willows. 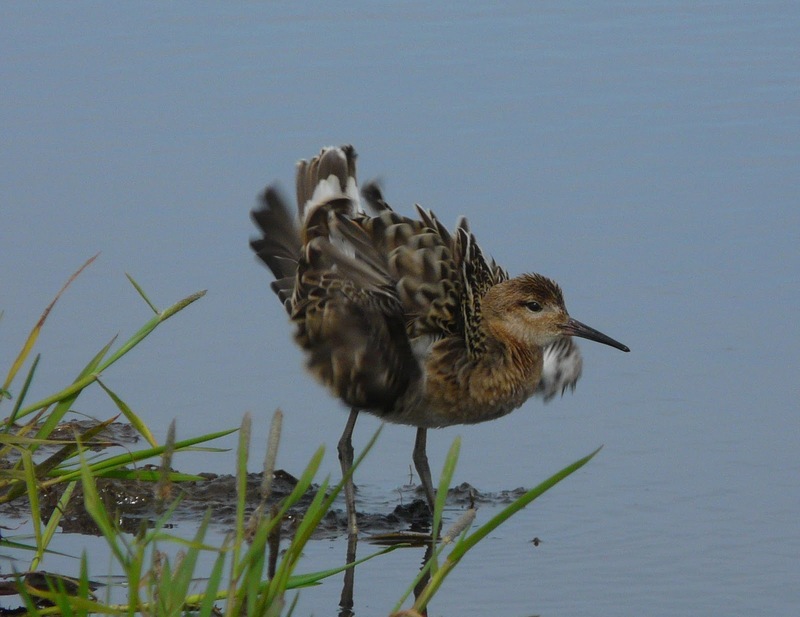 As each day passes come more signs of autumn, with returning waders mainly featuring on the first two days of August. Ruff numbers built from 5 on 1st (although 9 may have been present) to 8 the next day while there was also single Green and Common Sandpipers on the former date and counts of 801 Golden Plovers, 20 Whimbrels (including a flock of 16), 156 Curlews and 125 Redshanks were made on the latter. A Kestrel was new on 2nd, meanwhile Wildfowl are becoming more evident with 31 Teals on 1st, 10 Shovelers on 2nd and the Whooper Swan is still here. Big flocks of Arctic Terns also remain with 3137 on the 2nd but were also seeing some late breeding success with half a dozen newly fledged birds and a handful of large chicks ringed at the Nouster colony. Were expecting more passerine interest as easterly winds and rain arrive in the next few days but there was clearly a movement of Hirundines ahead of this weather on the 2nd, when there was an island record count of 19 Sand Martins, plus 112 Swallows and a House Martin. The first dispersing juvenile Sedge Warbler was caught and ringed at the observatory that evening and there was a small influx of 36 Wheatears while a couple of Common Redpolls lingered.